Updates and Information from ServiceDesk Plus all in this channel. Think that you know it all in ServiceDesk Plus? You may be in for a surprise! 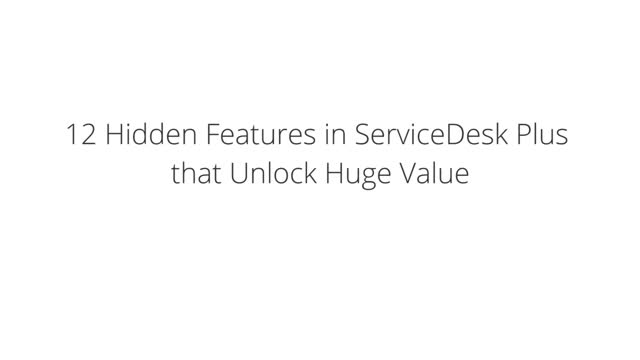 Watch this webinar to find out 12 lesser-known features of ServiceDesk Plus and how they help you enhance the value you get out of ServiceDesk Plus. What does it take to get your IT team to be smart and productive? This session will present a thorough review of important customization options in the ServiceDesk Plus Incident Management module that will shoot up your IT team's productivity. ServiceDesk Plus now integrates with Zoho Reports, a cloud-based, highly secure BI platform to address all your reporting pain points. With the new platform, IT service desk managers can create powerful reports within minutes using a flexible drag-and-drop interface without having to write database queries. Here is a webinar which will help you gain better insights about the integration. We may not have flying cars yet but the self-driving car is actually beginning its infancy. With all the technology swirling around us and in our pockets and purses surely the paradigm of the Service Desk has changed as well. Yes and No. Today’s users are bright and more tech-savvy in terms of using technology than ever before. As long as it works. But when something doesn't quite work, they want to solve it themselves using the easiest means at their disposal, Google, Twitter, Facebook, Instagram, Snapchat, etc. This might work well from their perspective but not from ours. Join George Spalding, Executive Vice President, Pink Elephant, as he focuses on the evolution of the Service Desk and what’s in store for the next 5 years. The idea behind the Service Catalogue has been intoxicating for IT organizations. Give people a simple list of services to choose from and then deliver them, lowering costs and increasing efficiency in the process. But there is a fundamental flaw in this model. We have entered the “experience age” where customers want much more than a simple order form. They now measure their satisfaction based not solely on simplicity, but on the totality of their experience. In this session, we will explore how customer attitudes and expectations are shifting, the “Four Moments of Truth” in a customer experience and the three ways that you must change your approach to a Service Catalogue to adapt to this future. What is the first step in building a successful Service Catalog? Understanding and gaining agreement on How To Define Your Services! This session describes the anatomy of a service and how to cut through the confusion and internal IT politics by starting from a top down business focus. While developing a Service Catalog can seem like a monumental task. Troy will describe a step-by-step approach to getting started. So register for the webinar soon! Barclay Rae elaborates on professional examples of ManageEngine for ITSM. Main emphasis was on Service Catalog and documented workflow.Hit Play to see what he shares. Real Time Case Study from Jason Beckett -Prime Healthcare Services,ServiceDesk Plus Customer.See what he has to share. Carl Franco talks about his experience using ManageEngine ServiceDesk Plus and fields audience questions.Click Play to view what he says.